On the heels of National Small Business Week, The Hill convened leading policymakers, entrepreneurs, economists and small business owners to share insights on the current state of entrepreneurship in 2018. The event, "Small Businesses, Big Ideas: Entrepreneurship in Action" illuminated both progress and challenges facing our nation's business environment and empowered attendees to advocate on issues impacting their startup and small business communities. Following opening remarks and a conversation between SBA Administrator Linda McMahon, Editor-in-Chief of The Hill Bob Cusack and Senator Ben Cardin (D-MD), our Institute Fellow Deloris Wilson joined an esteemed panel to share strategies for supporting startups and their founders. The "Supporting Startups" discussion, which also featured Erin Janklow - Founder and CEO of Entrada ESL, Susan Tynan - Founder and CEO of Framebridge, and Jeff Reid - Professor and Founding Director of the Georgetown Entrepreneurship Initiative, helped raise awareness of the differing needs between startups and small businesses. Speakers also described investment trends in regions outside of Silicon Valley, and illuminated barriers to social and financial capital experienced by women and minority founders. When asked what investors could do to help diversify their portfolios, Deloris referenced findings from the Institute's recently published report: "Building Inclusive Ecosystems with Intentionality: A Strategy to Support D.C.'s Women Founders." Specifically, she stressed the importance of engagement beyond traditional personal and professional networks; using targeted strategies to mentor companies outside of investors' existing portfolios; and programs that train diverse investors beginning at earlier stages in their careers. These and other strategies outlined in the report help counteract "pattern matching" techniques which can disadvantage underresourced founders. For a full recap of the day's events, including the "Supporting Startups" panel, click here. Deloris Wilson leads the Institute's work supporting BEACON: The D.C. Women Founders' Initiative, which provides recommendations and leads activities to improve the ecosystem for D.C.'s women entrepreneurs. You can read more about the Institute's work with BEACON in its 2017 Annual Report. Follow @thebeacondc on Twitter for updates. 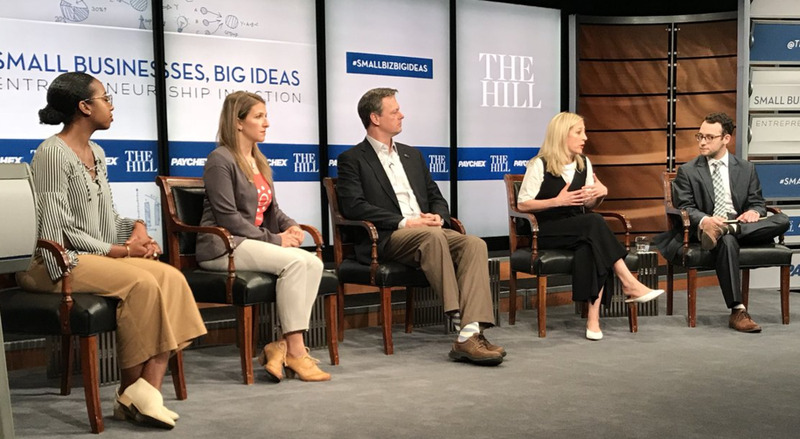 Institute Fellow Deloris Wilson (l) appears on a panel convened by The Hill on entrepreneurship.